Cheesy Baked Cauliflower is our family favorite way to serve cauliflower at our house! This dish also make a spectacular addition to your meal. This cauliflower dish is so easy to prepare and bake. Children and adults love Cheesy Baked Cauliflower. You are basically frosting the top of the cauliflower with the cheese mixture. If you like this baked version, how about trying my steam-cooked version of Steamed Cheesy Whole Cauliflower. Both of these version are excellent – it is just what is your family’s favorite way. * Any cheese of your choice may be substituted. To prepare cauliflower, remove the stem and green leaves from the bottom of the head. Trim the base of the core so that the head will stand upright. Place the whole head of cauliflower into a steamer basket, place the basket in a large pot, and add one inch of water. Cover, and bring to a boil over medium heat. Cook approximately 15 to 20 minutes or until tender when pierced. Preheat the oven to 375 degrees F. Place the head of cauliflower into a baking dish or pie plate. 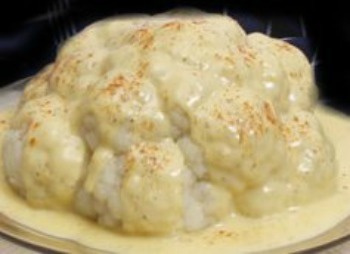 In a medium bowl, combine mayonnaise, and mustard; spread the mixture over the cauliflower. Sprinkle generously with Parmesan cheese. Bake, uncovered, approximately 10 to 15 minutes or until the cheese is golden brown and melted. 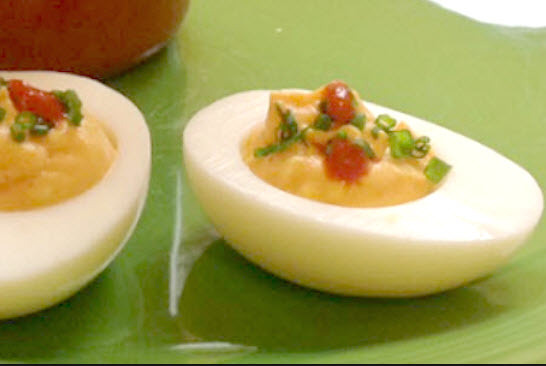 Makes approximately 2 to 4 servings.